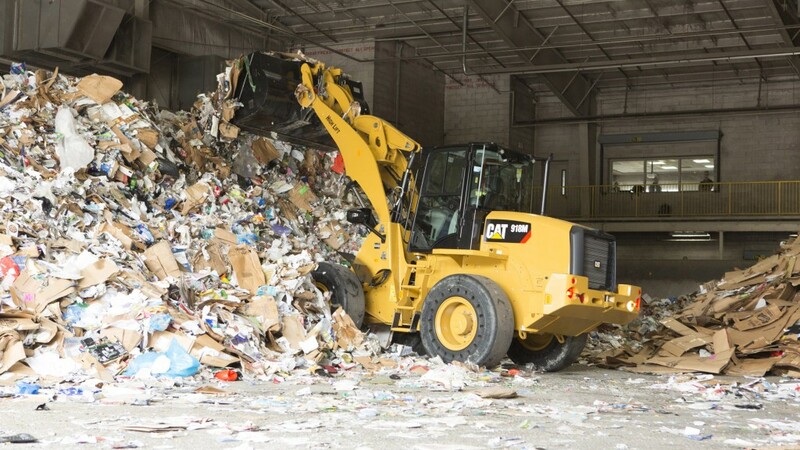 The new high-lift loader linkage option is designed specifically for applications in waste and recycling, agriculture, and construction that can benefit from increased lift height and increased reach of the loader linkage. The new high-lift loader linkage option is designed specifically for applications in waste and recycling, agriculture, and construction that can benefit from increased lift height and increased reach of the loader linkage. The newly designed loader arm assembly can provide up to 10 percent more lift height and reach compared with the standard loader linkage equipped with a similar work tool interface whether pin-on, IT (Integrated Tool Carrier) coupler or ISO coupler. A 918M configured with both a high lift linkage and 20.5 tires will have a bucket pin height over 13 feet, 5 inches (4.1 meters). With the addition of the Caterpillar designed Fusion Coupler System to the 918M's option list, buyers now have the choice of three couplers. Designed for optimum performance and long-term durability, the Fusion coupler uses an advanced constant pressure wedging mechanism to create a tight, rattle-free fit with work tools. The patented locking system eliminates the play (relative motion between coupler and work tool) and thus eliminates the wear that can result from this movement. The Fusion coupler is designed to apply constant hydraulic pressure to wedges that continually pull the work tool tight to the coupler in two directions, in and down, providing secure tool control and increased productivity. The coupler is available for Fusion-compatible work tool attachments. Three new 20.5R25 tires for the 918M offer a number of benefits, compared to the standard 17.5R25 tires, including up to 20 percent more tire life and increases in traction, stability, and tipping capacity—all resulting in reduced operating costs. Available for the North American market, the three new tire options include the general-application Goodyear E/L-2A "Sure Grip Loader," a 12-ply-rated bias tire with directional and self-cleaning tread; the Michelin "Xsnoplus," specially designed for operation on snow and ice, and incorporating a non-directional tread pattern with excellent self-cleaning characteristics; and the Michelin XHA2 radial, a wide-lug tire with non-directional tread, heavy shoulders, and protected sidewalls for heavy-duty applications. A consortium of world-leading companies comprising Montreal-based Enerkem, Air Liquide, Nouryon and the Port of Rotterdam, has announced that Shell will join as a partner in Europe's first advanced waste-to-chemicals facility in Rotterdam, the Netherlands. According to Enerkem, Shell will become an equal equity partner in the proposed commercial-scale waste-to-chemicals (W2C) project, which will be the first of its kind in Europe to make valuable chemicals and bio-fuels out of non-recyclable waste materials. The CEO and Executive Director of the Solid Waste Association of North America (SWANA), David Biderman, has been appointed again to the Environmental Technologies Trade Advisory Committee (ETTAC), representing the waste management and recycling segment of the U.S. environmental technology industry. Mauser Packaging Solutions, a global leader in solutions and services across the packaging lifecycle, has launched the first medical waste container made of 100% recycled plastics generated from post-consumer packaging waste. The innovative concept has been awarded the 3rd prize in the 2018 NENnovation Award presented by the Dutch Standardization Institute NEN. Toronto-based Waste Connections, Inc. has acquired American Disposal Services, Inc. and certain affiliates, one of the largest privately-owned solid waste collection and recycling businesses in the Mid-Atlantic states. American has total annualized revenues of approximately $175 million and serves approximately 400,000 customers in Virginia, Maryland, Georgia and Colorado. The Alameda County Waste Management Authority (StopWaste) has been awarded a $263,000 grant by the Bay Area Air Quality Management District to work with Livermore Sanitation, Inc. (LSI) and use Compology's automated, camera-based dumpster monitoring technology to reduce contamination in commercial business compost streams and increase diversion of organics from landfills. Diversion Strategies will oversee the tracking and reporting of progress. This article is from CIF Connections Blog, October 19, 2018.